Today’ Mars is very cold, very dry and very inhospitable, practically a dead place but this wasn’t always the case, things were very different in the ancient past. Scientists believe early Mars had a substantial atmosphere in the past than it does today, an atmosphere much more similar to Earth’s. More than 3.6 billion years ago, climatic conditions appear to have been favorable for the presence of liquid water on Mars’ surface, this in turn gave rise to speculation that Mars was capable of supporting life and even a home to a native civilization. But over time, the Red Planet lost most of its carbon dioxide-dominated atmosphere; this atmospheric loss led to depressurization and cooling, and is thought to be the primary driving force responsible for the loss of liquid water from its surface. MAVEN principal investigator Bruce Jakosky, said. The present atmospheric surface pressure is about 6 millibars on an average, which is about 0.6% of Earth’s, and is composed of 95.32% CO2, 2.7% N2 and 1.6% argon by volume. Mars’ dramatic transition is tied to the loss of its atmosphere, so the big question is, how did Mars lose its atmosphere? One of the main differences between the Earth and Mars is the lack of a significant magnetic field and smaller surface gravity on Mars. A global magnetic field provides shielding from incoming charged particles and also prevents escape of outgoing ions. Mars is too small, has only half Earth’s diameter, 11% its mass and 38% its gravity thus making it easy for upper layers to escape into the vacuum of space. Nearby Supernovae contribute to Mars atmosphere loss? In a new study*, uploaded on arxiv servers on May 3, astronomer Dimitra Atri suggest that in addition to solar storms and radiations, it is likely that Mars atmosphere has been exposed to radiation bursts from high-energy astrophysical sources which become highly probable on timescales of billion years and beyond. The idea that nearby supernovae can inject energy and damage planetary atmospheres was given by Ruderman (1974). Recent reports based on the on measurements of 60Fe deposition on the ocean floor provide evidence of a 2.2 million years old supernova located at a distance between 20-430 light years away from Mars. Other studies also report the possibility of 16 events in the past 13 million years within 320 light years in the Local Bubble. So, supernovae explosion are not rare, scientists calculated this frequency of such nearby explosions, with at least one event occurring every 2-4 million year. On timescales of billion of years, such events become important. Atri team’ calculations suggest a significant probability of a Galactic GRB beaming towards the Red Planet in the past 1 billion years. Atri’ models appears to be the most effective in Mars atmosphere depletion due to long duration of the event. 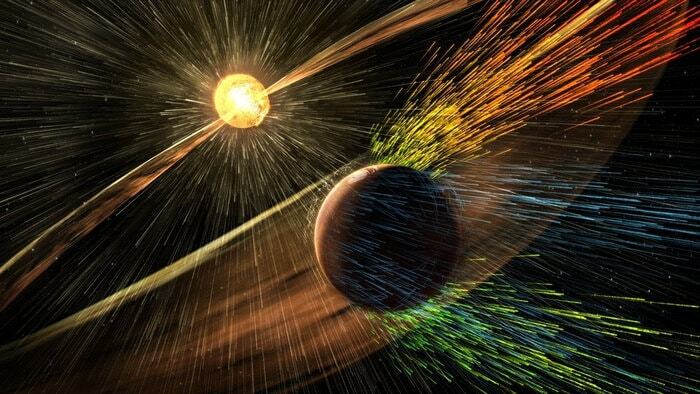 Did high energy astrophysical sources contribute to Martian atmospheric loss?